End plates are used to insulate a stack of terminal blocks. they have same profile as that of the terminal block and are available in different colours to match the colour of the terminal block. 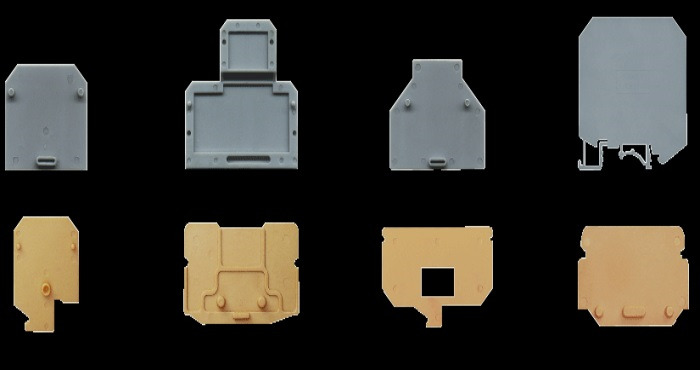 For terminal blocks made using Polyamide 6,6 housing, the end plates are "snap-on" type i.e. they get press fitted on the terminal block side whereas in case of Melamine terminal blocks, the end plate require support by end clamps. Certain terminal blocks are so designed that they have both the sides closed and hence it is not required to mount on end plate at the end of the stack. However for the other terminal blocks with their one side open, it is normal practice to mount the end plate at the end of the stack to insulate the live parts as a safety measure against an electric shock hazard.